The 2006 Volkswagen Nanospyder was one of the entries to the annual LA Auto Show's Design Challenge. 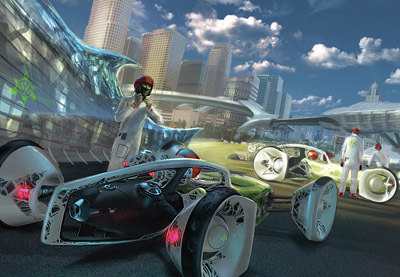 The Volkswagen Nanospyder exists in a fictional, yet possible, future where the Department of Transport has made it a legal requirement that vehicles must be 100% recyclable. And in order to keep up to date with the latest safety advances vehicles only have a lifespan of 5 years. 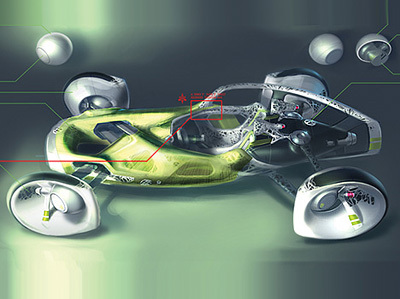 The construction process of the Volkswagen Nanospyder would be unlike any ever used on a vehicle before. 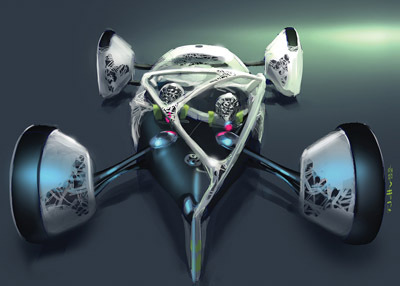 The Nanospyder would use nano-technology to create a vehicle capable of being assembled, disassembled, and reassembled on a microscopic level. Billions of tiny nano-machines no larger than a half a millimeter in diameter would attach themselves to one another in a large assembly tank in order to form a complete vehicle. After the Nanospyder's 5 year lifespan the vehicle would be returned to the tank, the nano-machines would disconnect, and then await instructions to form the next generation of Volkswagen vehicles. The ability to vary the apparent density of the Volkswagen Nanospyder's frame would allow the ability to engineer "crumple zones" for safety. Using sensor data the nano-machines would be able to sense an impending collision and strengthen or weaken their connection to each other to ensure the survival of the passengers. Power for the Volkswagen Nanospyder concept would come from electricity, provided by a bio-engineered protein on the skin of the vehicle using photosynthesis, and a hydrogen-fueled power source. The Volkswagen Nanospyder is a brilliant and innovative idea, but if we're complaining about the complexity of computer controlled engine management systems now, imagine the skills needed to work on the Nanospyder. Maintenance would require an entirely new form of mechanic to perform even the most basic services.